Lions Tigers & Bears, Oh My! 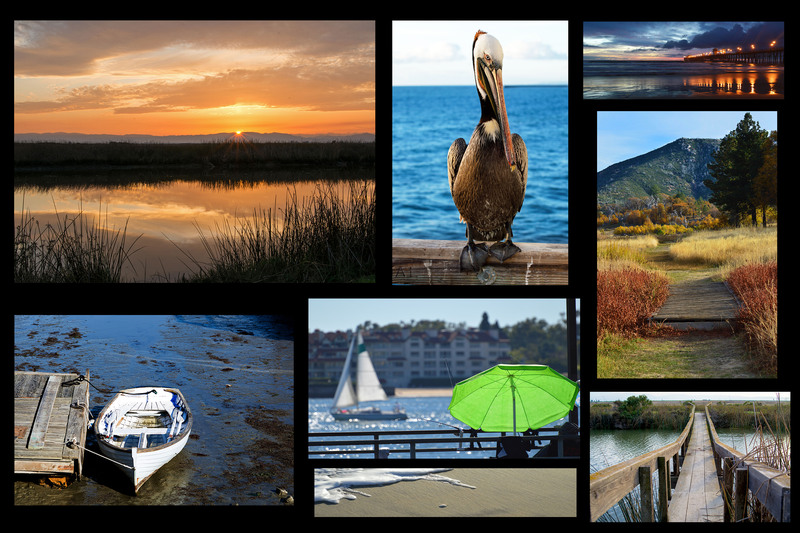 We are always on the lookout for unusual and interesting things to do here at Staycations California. 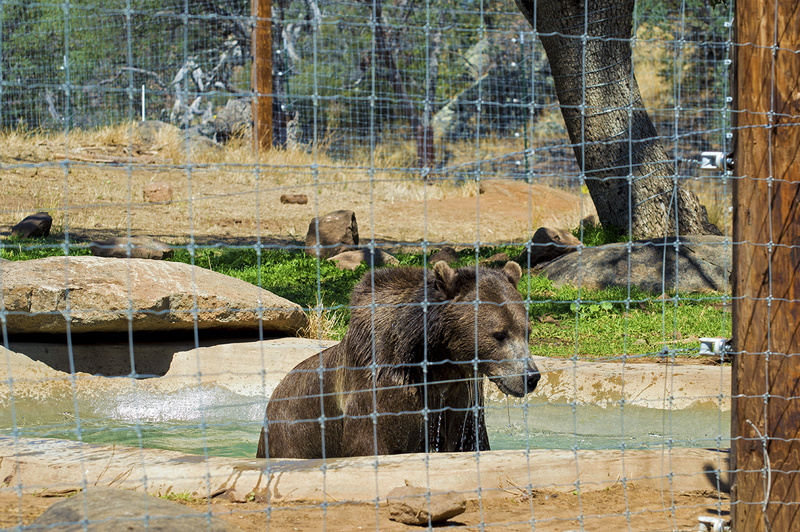 So perusing through our trusty Groupons we came across the Lions Tigers & Bears Sanctuary in Alpine, California. 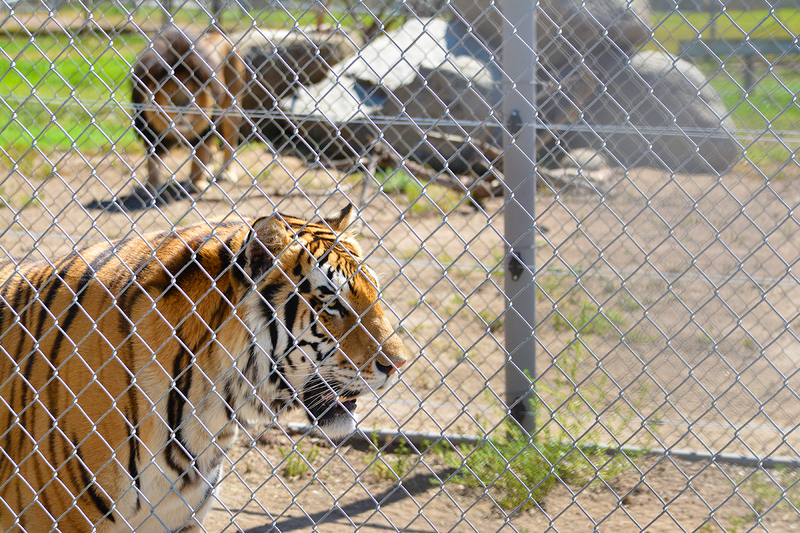 Lions Tigers & Bears is a non-profit rescue facility that provides a safe haven for unwanted and abused Big Cats and other exotic animals. 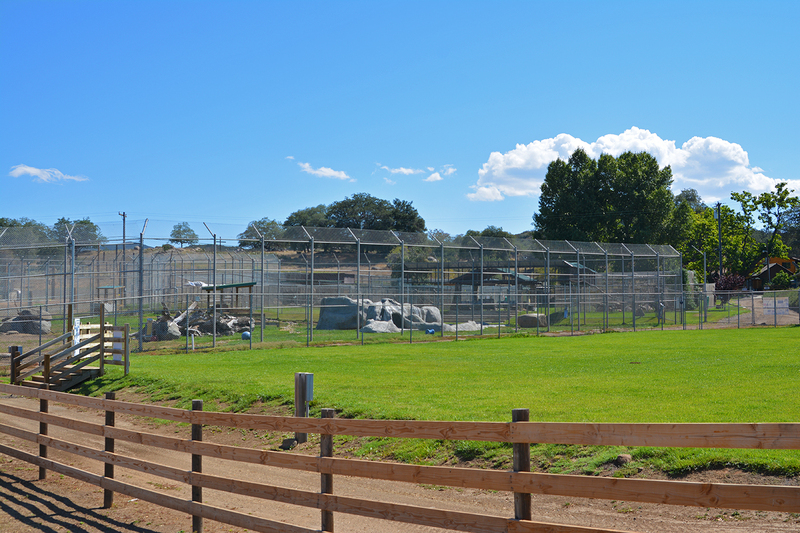 The facility allows the animals to live out their lives with love, safety, and medical care. 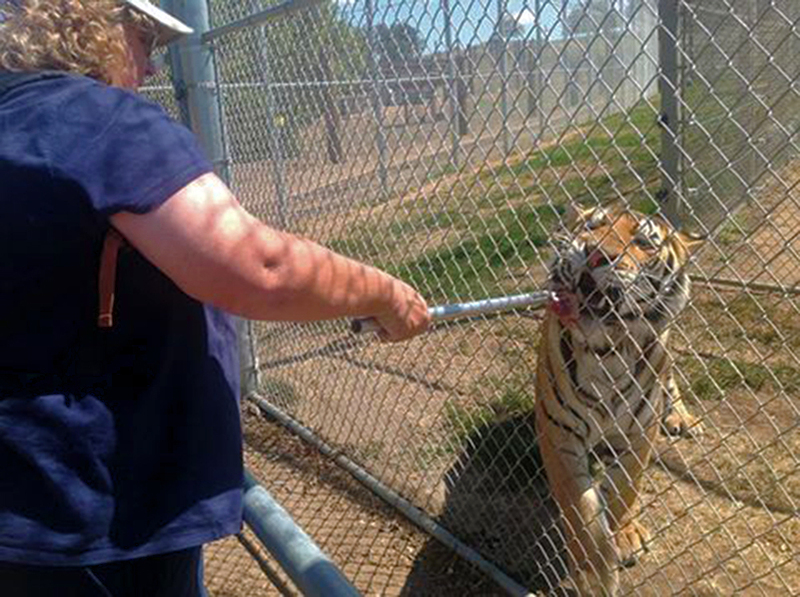 Founder, Bobbi Brink, started LTB after witnessing the abuse affiliated with the “exotic animal trade” where animals were subjected to terrible care and conditions. 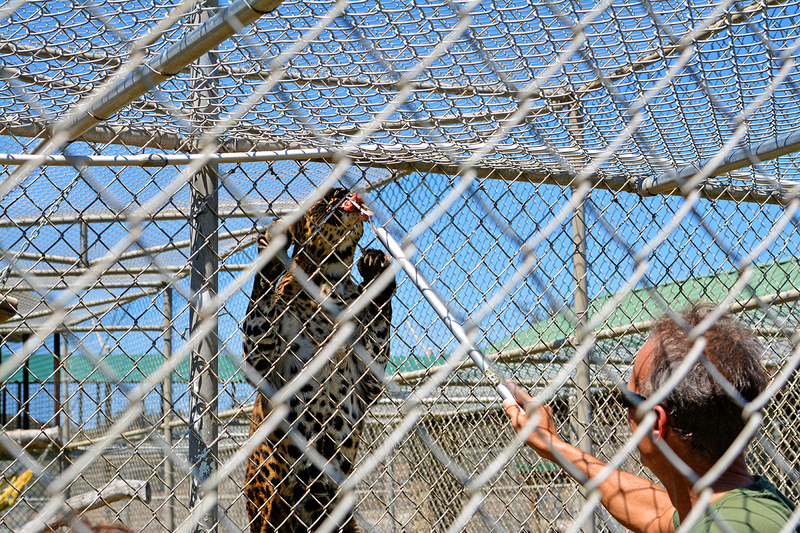 The facility started out helping big cats but soon ended up taking in a few different types of bears. 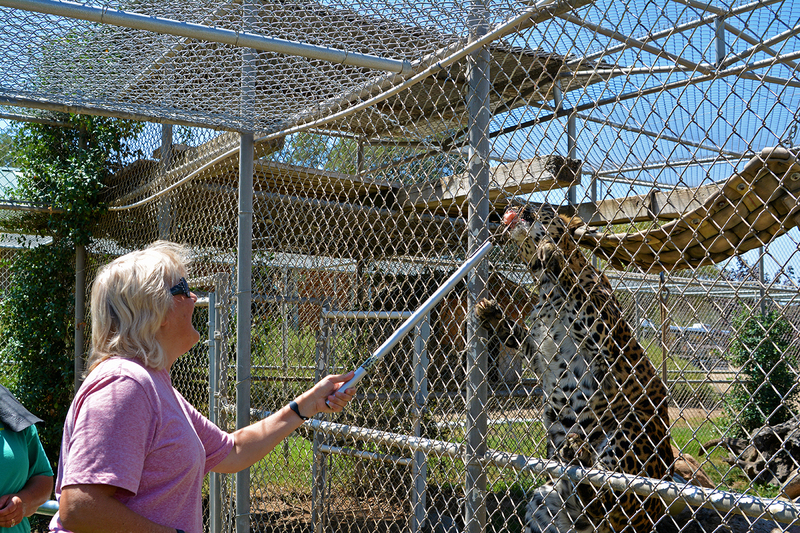 Walking tours are offered at the facility to view and feed these wonderful animals. 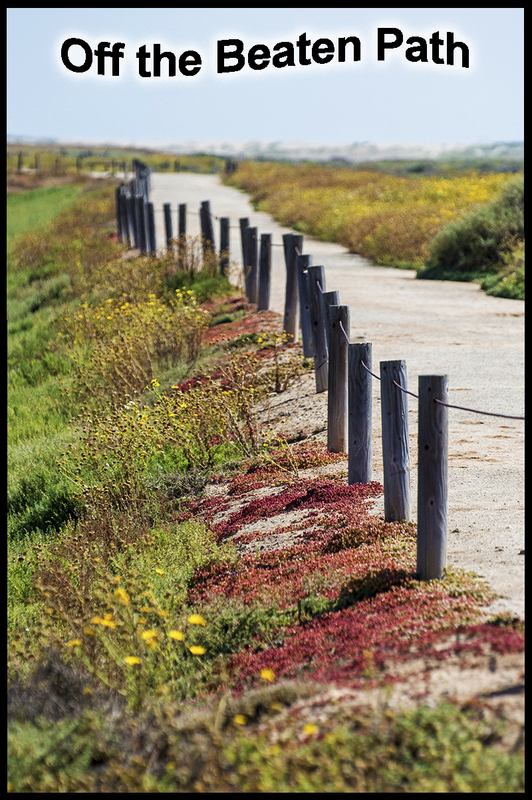 Guides offer up information along the way and all questions are answered by the informative staff. 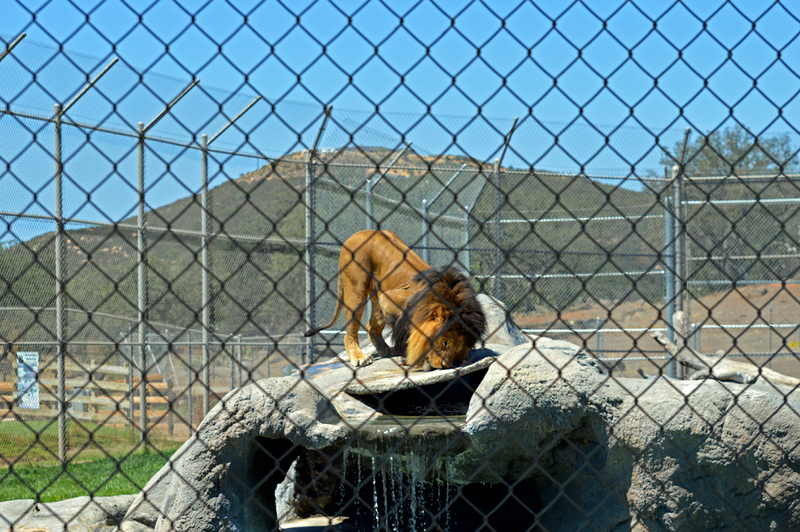 There are double fences around each enclosure which made it safe for separation of the animals but made it hard to get a photo without a chain link fence in the shot. 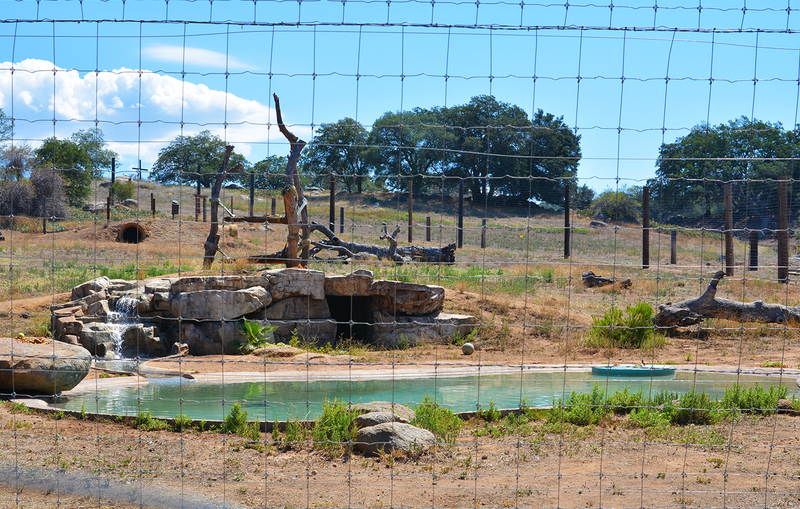 Feeding the animals is an extra fee and you are allowed to go beyond the first fence to get up-close. You also get to pick which one you want to feed. Will it be the hungry lion, tiger, or bear? Don’t worry, the 30 foot plus fence stands between you as dinner. Did I say “as” dinner? I meant, you “and” dinner. All kidding aside, these animals were born into captivity and it is always uncertain how they would react with human contact as they grow older. 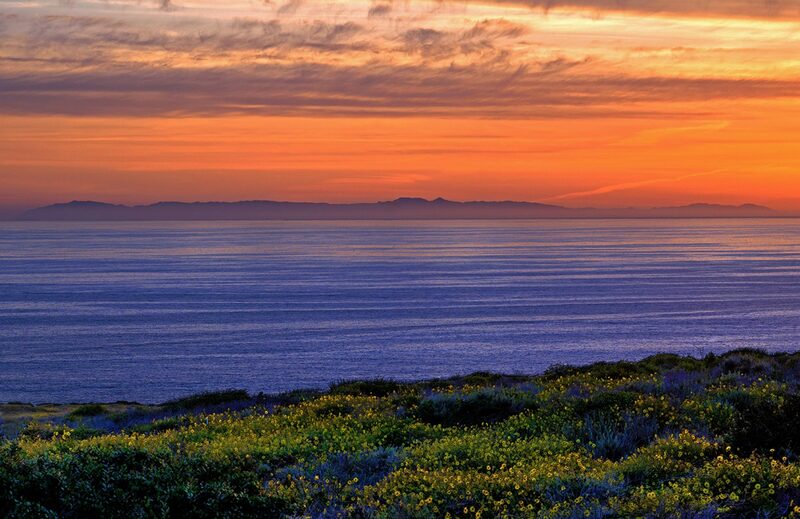 So best to stay behind the barriers and admire them from afar. During the feeding an extra long barbecue type fork is used to offer up the meal between the links of the fence. There is plenty of room for safety, yet it is close enough to see the whites of their eyes, or the yellow of their eyes in some cases. I choose the tiger and was mesmerized on how big his paws were. They were the size of a human face! This magnificent animal gladly accepted each bite of food it was offered and you almost felt like petting it if you could…almost. You can participate in the two feedings daily or just sign up for the tour. Seeing the size of the tiger, I was glad I live in California where these cats don’t roam around freely. Still, you can’t help but appreciate these large animals and feel happy that they have a great home. On to the bears which are a part of California wildlife. 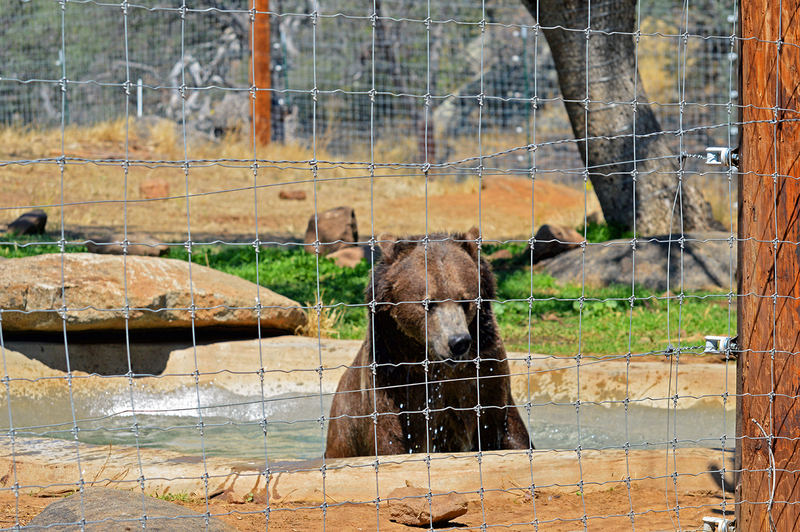 The sanctuary had a few different breeds including Black and Grizzly. 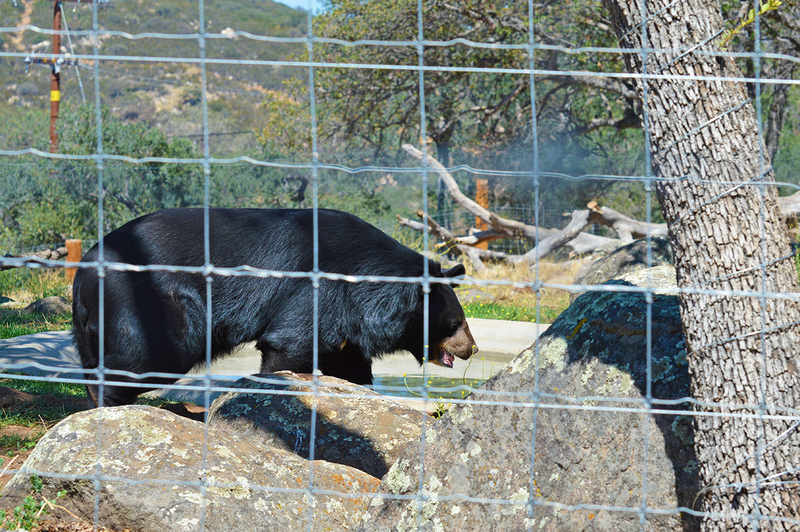 The bears were brought out of their pens to hunt for the meat chunks that were earlier placed in their habitat. One bear bypassed the food and headed straight for the pool of water. The big beast was in heaven as it splashed around in the mid day heat. Again, you marveled at the size of these animals and it made me feel glad yet again, that I live in a city where my only concern about getting bit is by a mosquito. The big draw was the leopard with most of the group holding out to feed this colorful and spotted animal. 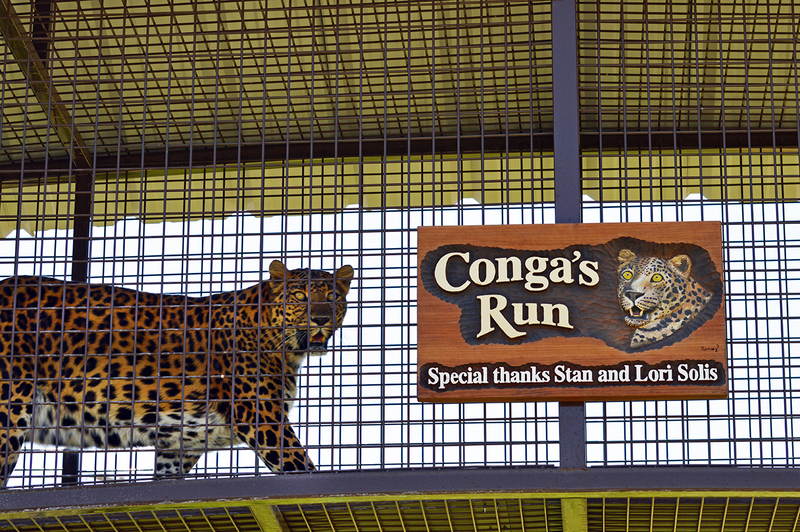 Because of a generous donor, Conga the leopard had her own enclosed skyway that allowed her to view all action taking place below. She knew it was almost feeding time as she paced back and forth eyeballing the volunteers while waiting for them to arrive with her meal. Showing off her climbing abilities, she easily ascended high on the chain link fence to pick off the food from your outstretched fork. 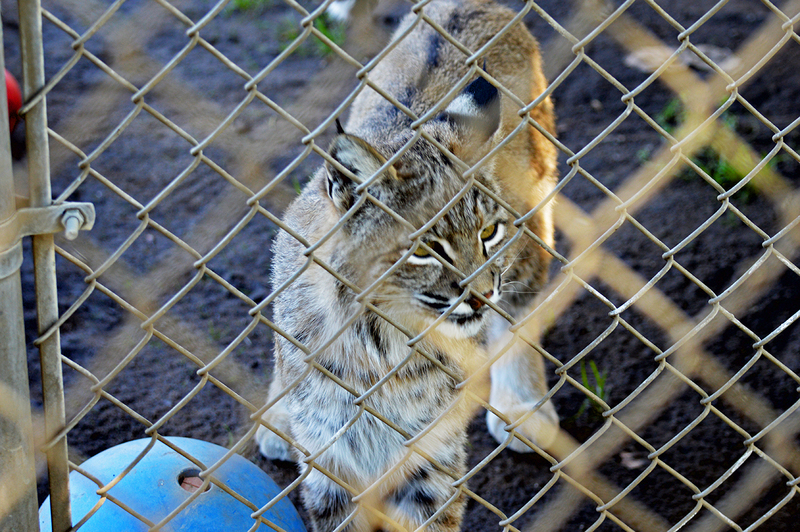 The facility also had bobcats and mountain lions. 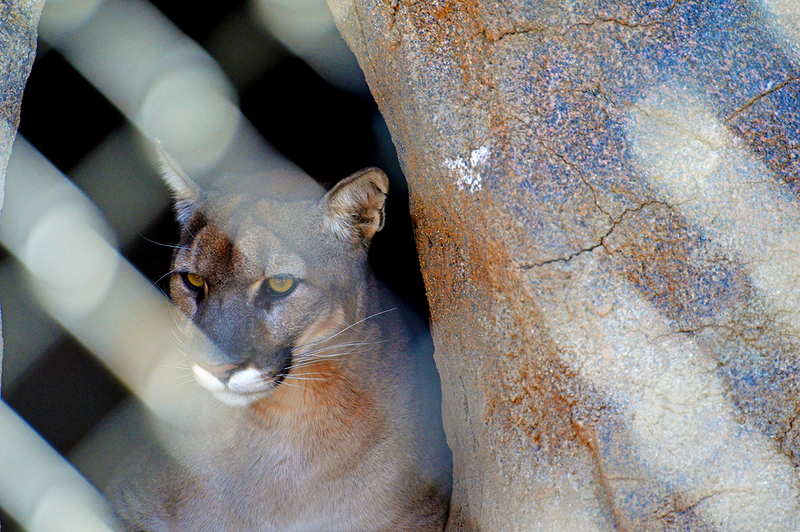 It was the first time I have seen a mountain lion and again this is an animal we could possibly run into on California hiking trails. They told us that they can chirp like birds and it is an unusual sound to be wary of if you hear it in the wilderness. Best defense is to be prepared with pepper spray and a whistle. Most of these animals cannot be returned to the wilderness for one reason or another, so they happily live out their life under the guidance of the founder and volunteers. Their beginnings may have been terrible but this part of their life at the sanctuary will be filled with love and care. 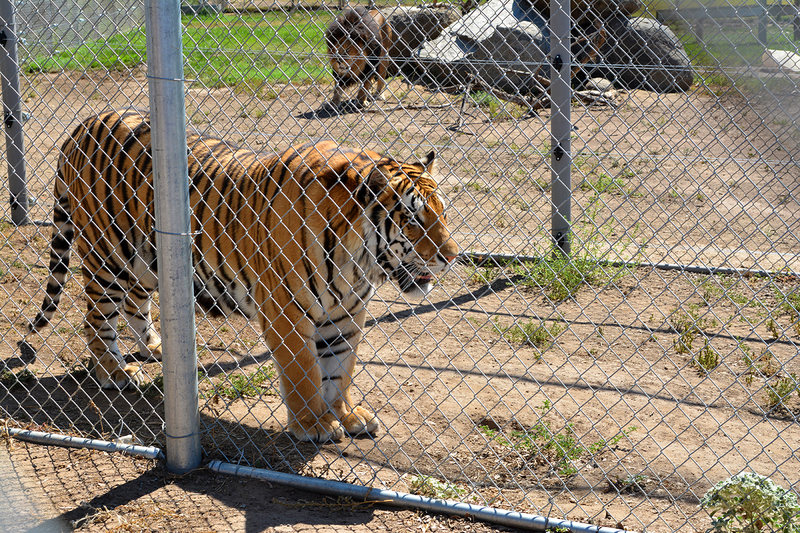 Bobbi Brink has a home on the facility and there is also a retreat where you can stay overnight and enjoy the sounds of wild animals at night. Imagine going to sleep with the sound of a lion roaring or a tiger growling. That is something we don’t experience every day. There is also a fully operational medical room on site for immediate animal care. We made our way to a shaded area with chairs and tables to enjoy a cold drink after the tour. The grand finale was announced and all eyes glanced towards the large but empty area just a few feet away. Out came the lions searching for the food that was strewn about in the enclosure. After the munch-out, they drank from the pool of water and then settled in for a well deserved nap. 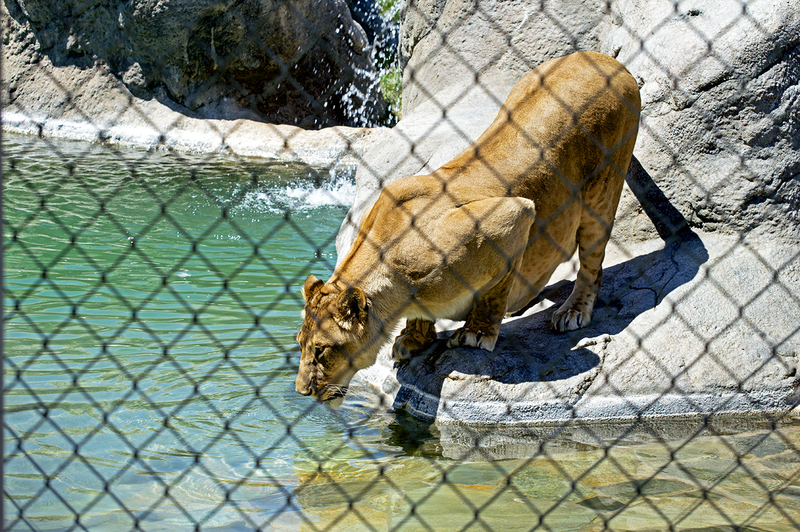 One lion growled a little at the tigers that were caged close by but soon joined the others for the afternoon siesta. It was awesome to see them roam free in their own habitat. 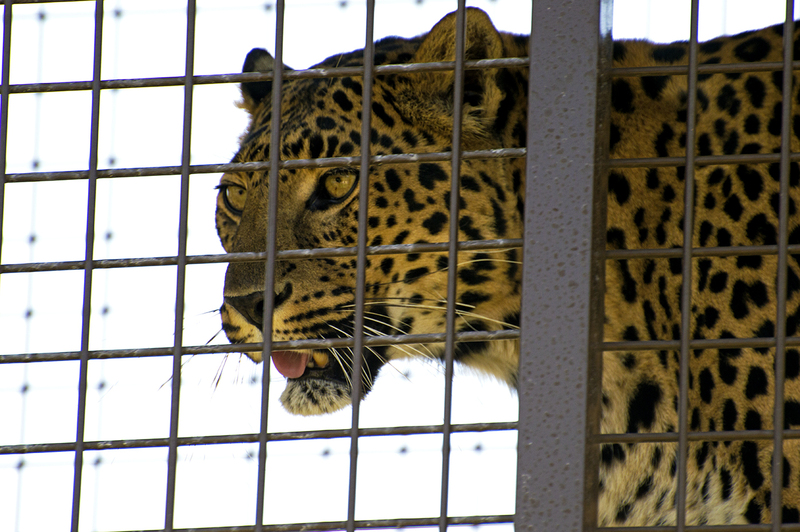 You were then allowed to walk freely around the facility to take a look at all the animals again. All and all, it was an interesting tour and experience. 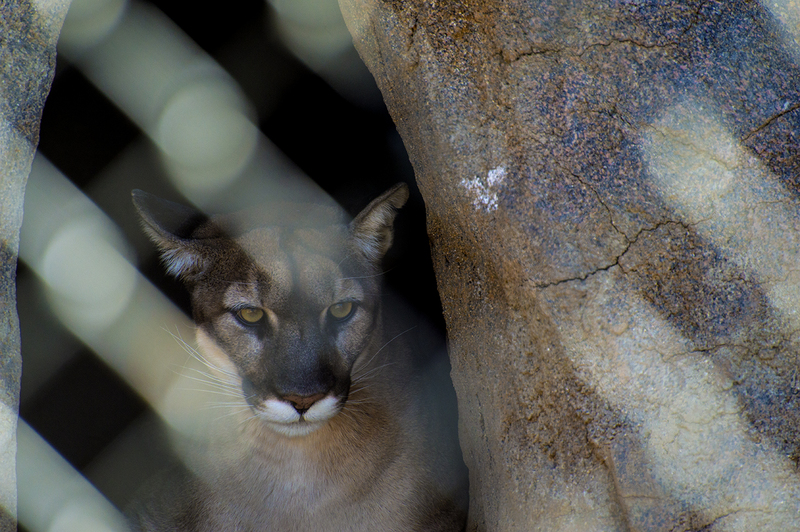 It is not every day you can be so close to wild animals, especially these magnificent cats. As dangerous as some of these animals could be, we couldn’t ignore the fact that they had been animals that were abused, neglected, or unwanted by man. 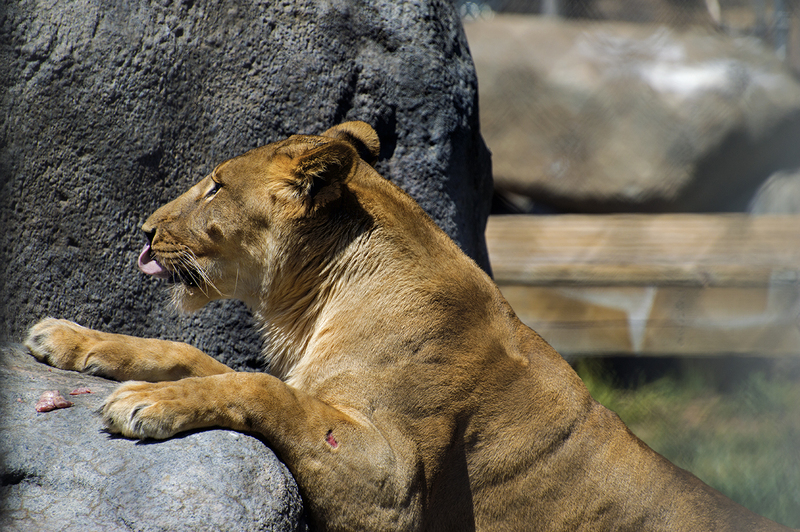 Thankfully, the Lion Tigers & Bears Sanctuary is around to care for them unconditionally. 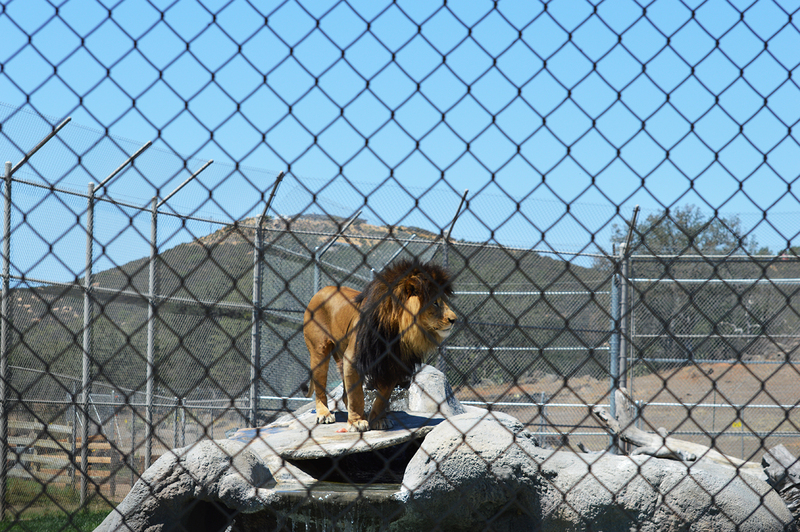 Seeing this lion eyeball me made me glad there were not one but two fences between us.